The main purpose on the enduro and motocross riders is to become an excellent rider not a sticker’s applier. Therefore we offer plastics with pre applied stickers. With these products we guarantee you plastics sets with professionally applied stickers. This way you do not have to worry about cleaning the plastics surface and applying the stickers correctly. We will apply stickers for you for no extra charge. 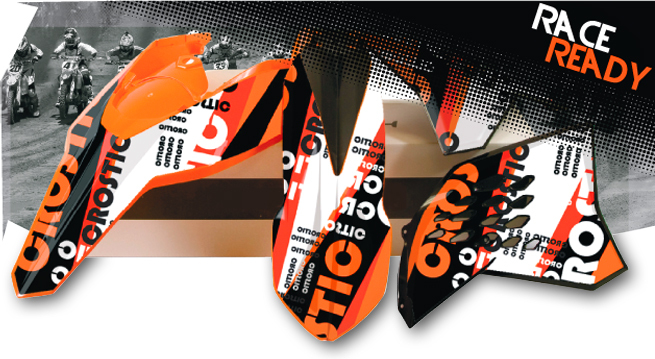 The set of plastics with pre applied stickers will be delivered for you in a comfortable “Race Ready” format. It means that you can apply the plastics to your bike and immediately and enjoy the ride. Contact us now and we will make you a great offer.